Our charging stand only fit for Fitbit Alta HR, not suitable for other Fitbit smart watches. 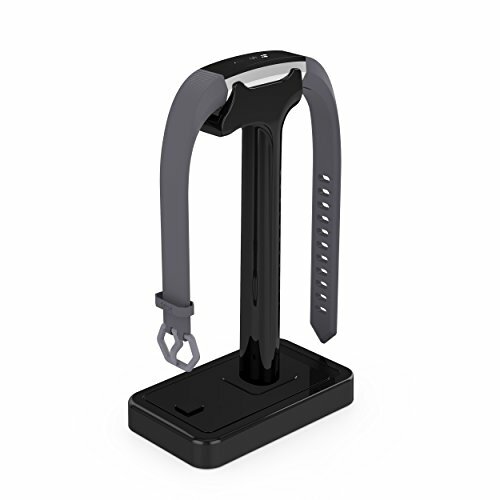 The height of this charger is specially designed according to the length of your watch band and the size of the base,and with the anti-slip bottom.Prevent the charger from falling over or moving away. Easy to check the charging status with only one action. Press the button at the bottom makes you clear about the watch energy whenever you like. Quickly click the button 3 times within 5 seconds to restart the watch. When your watch has no power for a long time, it will charge slowly at the beginning and as long as the charging energy exceeds 10%, it will return to normal charging situation.Tips: Do not charge your watch until the battery totally run out. It is not good for the life of battery. 1. Do not charge Fitbit Alta HR over 2 hours each time. 2. For your battery life,recommended to connect to a Laptop or PC or MAC charge, the voltage is more stable. If you have any questions about this product by GOOQ, contact us by completing and submitting the form below. If you are looking for a specif part number, please include it with your message.